1. Imbalance in scrutiny: Do they vet statements by Democrats or Democratic-leaning organizations more than statements Republicans or Republican-leaning organizations? 2. Batting average by party: Roughly n_correct/n_checked, but instantiated here as mean Politifact rating. Until now, Politifact has checked veracity 3,859 statements by 703 politicians and organizations. Of these, I was able to establish the partisanship of 554 people and organizations. I restrict the analysis to 3,396 statements by organizations and people whose partisanship I could establish and who lean either towards the Republican or Democratic party. I code the Politifact 6-point True to Pants on Fire scale (true, mostly-true, half-true, barely-true, false, pants-fire) linearly so that it lies between 0 (pants-fire) and 1 (true). Of the 3,396 statements, about 44% (n = 1506) of the statements checked by PolitiFact are by Democrats or Democratic-leaning organizations. Rest of the roughly 56% (n = 1890) are by Republicans or Republican-leaning organizations. The average PolitiFact rating of statements by Democrats or Democratic-leaning organizations (batting average) is .63; it is .49 for statements by Republicans or Republican-leaning organizations. 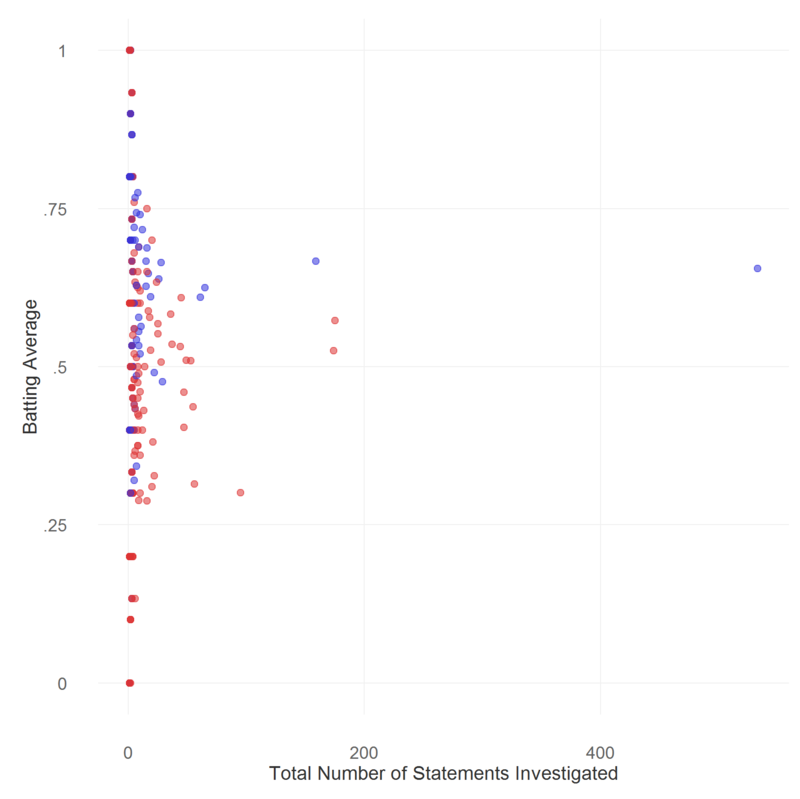 To check whether the results are driven by some people receiving a lot of scrutiny, I tallied the total number of statements investigated for each person. Unsurprisingly, there is a large skew, with a few prominent politicians receiving a bulk of the attention. For instance, PolitiFact investigated more than 500 claims by Barack Obama alone. The figure below plots the total number of statements investigated for thirty politicians receiving the most scrutiny. If you take out Barack Obama, the percentage of Democrats receiving scrutiny reduces to 33.98%. More generally, limiting ourselves to the bottom 90% of the politicians in terms of scrutiny received, the share of Democrats is about 42.75%. 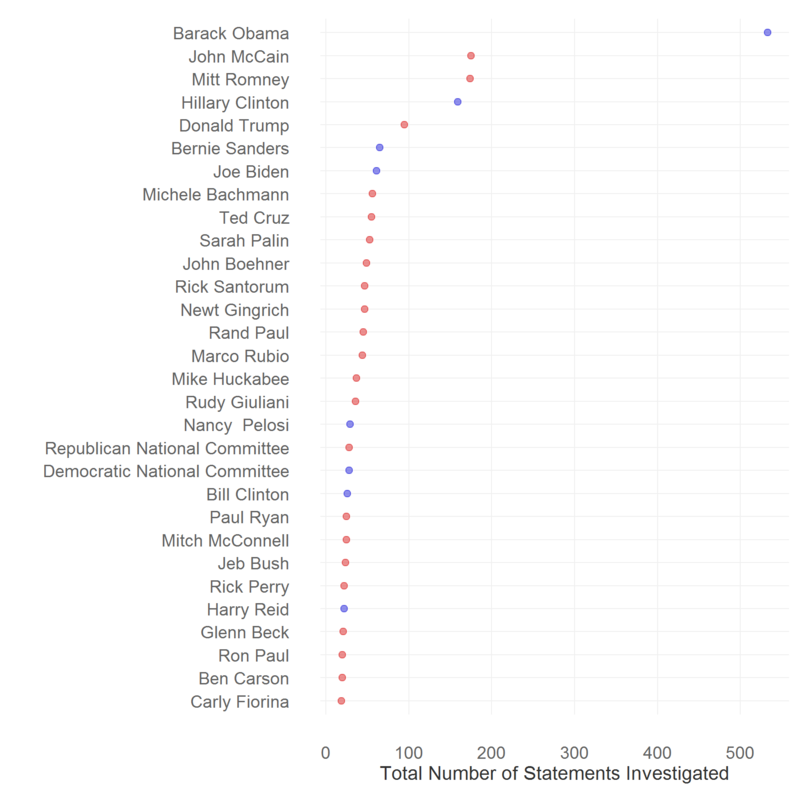 To analyze whether there is selection bias in covering politicians who say incorrect things more often, I estimated the correlation between the batting average and the total number of statements investigated. The correlation is very weak and does not appear to vary systematically by party. Accounting for the skew by taking the log of the total statements or by estimating a rank-ordered correlation has little effect. The figure below plots batting average as a function of total statements investigated. 1. The number of statements made by Republicans and Republican-leaning persons and organizations is the same as that made by people and organizations on the left. 2. Truthiness of statements by Republican and Republican-leaning persons and organizations is the same as that of left-leaning people and organizations.